Affirmative Action in college admissions has been a source of controversy since its inception. Historically, the argument has been framed as a cost benefit analysis between the consequences to Whites denied admission to an institution because of Affirmative Action policies versus the benefits to historically underrepresented minorities admitted in their stead. 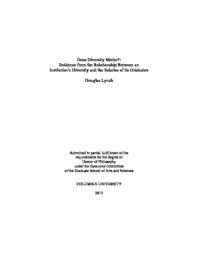 This dissertation furthers the conversation by introducing a theoretical model grounded in the literature that explains why employers might seek college graduates who have been exposed to more diversity and then empirically explores the benefits to graduates who attend more racially and ethnically diverse institutions. It posits a parabolic empirical relationship between an institution's racial and ethnic diversity and the salaries of its graduates, with too much diversity being as undesirable as too little diversity. It does not assume that the benefits to diversity are necessarily academic but may be another set of skills--a "cosmopolitan" skill set--that employers value. Using the Bachelor & Beyond Database (BB: 93), U.S. News Rankings, and the College Board's Annual survey of colleges, the empirical work looks at 8,054 college graduates from 466 colleges. The empirical work uses three models: Ordinary Least Square with Controls, Hierarchical Linear Modeling, and Propensity Score Matching. All models control for both individual and institutional variables the literature has found to impact salaries of college graduates. The three models use two continuous variables as the variables of interest in terms of institutional diversity--percent Black and percent minority--as well as dummy variables for percent Black and percent minority. The findings were modest but consistent across the models, suggesting first that there is a parabolic effect and that modest racial and ethnic institutional diversity is beneficial to White graduates but has no benefit to Hispanic or Black graduates. The benefits in terms of percent increase of earnings for White students ranged from 4.6% using an OLS model for students at non-selective institutions to 10.5% percent increase in earnings for White graduates of more diverse institutions using the propensity score matching model at selective institutions. The findings suggest that for individual White students, there is an economic benefit to attending a slightly more diverse institution, but not for minorities, who should simply attend the most selective institution to which they are admitted. For institutions, it suggests that if their goal is to maximize earnings of their graduates, they should build a diverse cohort of students. For policymakers, the findings suggest that eliminating Affirmative Action may penalize White students more than any other racial or ethnic group.